The duchess picks a monochromatic look while out supporting a great cause. It looks like Catherine, Duchess of Cambridge, isn't the only member of the royal family who loves a winter-white ensemble. 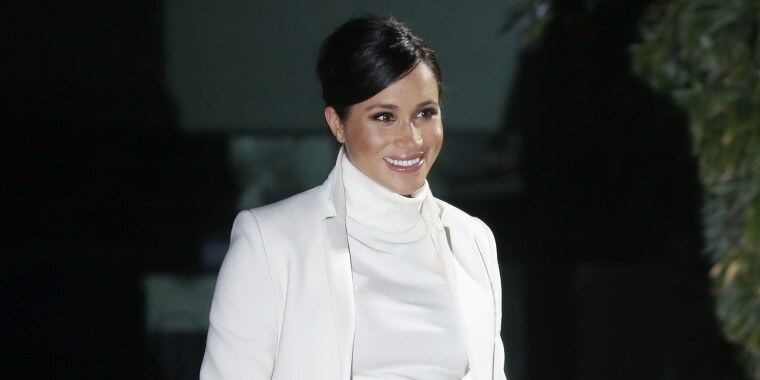 The former Meghan Markle chose a striking, all-white look that included a turtleneck dress by Calvin Klein and a coordinating coat by Amanda Wakeley for a night out with Prince Harry. She opted for a retro twist to the classic chignon hairstyle, letting her natural glow take center stage. The royal couple attended a special performance of "The Wider Earth" at the Natural History Museum in London. The gala event and production supported The Queen's Commonwealth Trust and The Queen's Commonwealth Canopy, both of which focus on forest conservation. This isn't the first time Meghan, Duchess of Sussex, wore this coat. Back in March 2018, when she joined the royal family for her first official engagement at the Commonwealth Service at Westminster Abbey, she opted for the white coat with a black dress, topping off the look with a simple black handbag and chic white beret. In fact, the duchess seems to have an affinity for white coats. How could anyone forget the gorgeous white wrap coat by Canadian brand Line the Label she wore in the couple's post-engagement debut at Kensington Palace? The coat was styled over a forest-green dress with Aquazzura heels (a favorite for the duchess), adding a pair of yellow gold and opal earrings to complement the stunning ring Prince Harry designed using diamonds from the late Princess Diana's collection. If we look even further back, it seems the duchess was into the white turtleneck look way before she became a style icon. Whether she's heading out for a glam night or spending time with the rest of the royal family, the duchess knows her way around a monochromatic look.